Here's a neat 12x16 barn shed with side porch built by one of my customers John Miller. 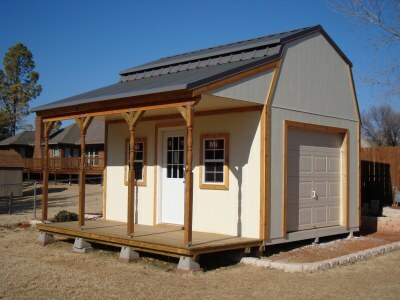 "These plans were exactly what I was looking for and were easy to modify to fit my work shop and storage needs. I modified the roof gussets and added purlins' for additional strength. I chose a metal roof for ease of maintenance and spruced up the deck posts to add visual appeal to the building. 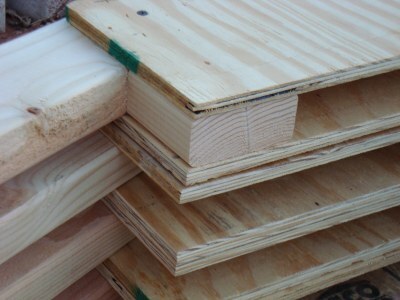 I have included the purlin modification view and finished pictures. Great plans, my neighbors asked when we are having the 'open house party' and I get a lot of great comments from those who view the building from the walking track at the rear of our property". John did such a beautiful job building this shed! The plans show a shingled roof but John modified the construction by building his barn with a metal roof. 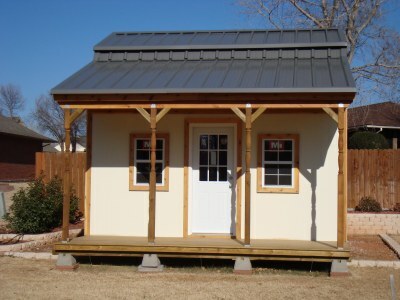 The metal roof offers very low maintenance and this is a great idea. In order to do this he also modified the truss gussets by adding purlins for additional strength. 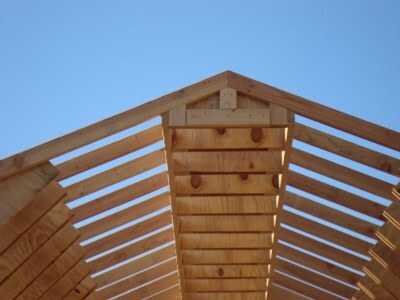 Construction of a roof is so much easier using trusses as opposed to stick framing with a ridge board and Johns modification of the truss gusset plates was a really neat idea. This small barn also features a custom built side door or you can add a pre-hung exterior entry door as John did here. He also added 2 windows to either side of the door. Thanks again Mr. Miller for sending me these great pictures of your barn shed project! You have done a wonderful job with the construction and selection of colors. Plans for this barn shed can be found here. Resource of construction techniques and installation method for everything from foundations to finishes.